England opener Tammy Beaumont top-scored 47 against Yorkshire Diamonds to lead Surrey Stars to their first Super League win. Surrey's six-wicket victory in front of a crowd of 2,250 at The Oval consigned Diamonds to their second defeat in two games since the competition started. Yorkshire posted 134-5, Hollie Armitage leading the way with 43. Beaumont shared a 65-run first-wicket stand with Bryony Smith to help the Stars triumph in their first home game. Assisted by a quick outfield, the visitors raced along to 74 without loss before Alex Hartley struck twice in three balls - the England off-spinner taking a simple caught and bowled after a leading edge from Lauren Winfield before she bowled Armitage. Stars skipper Natalie Sciver, with one stump to aim at, ran out Beth Mooney after collecting the ball sharply at extra cover, as the hosts battled their way back into the contest brilliantly and the visitors stuttered. The home side looked to attack the ball from the off and Diamonds debutant Laura Spragg's only over went disastrously wrong, with the former England bowler opening up with three wides on the way to conceding 16 runs in an 11-ball over. Smith batted fearlessly, hitting four boundaries in one Katherine Brunt over, before being caught at point off Jenny Gunn for 31. 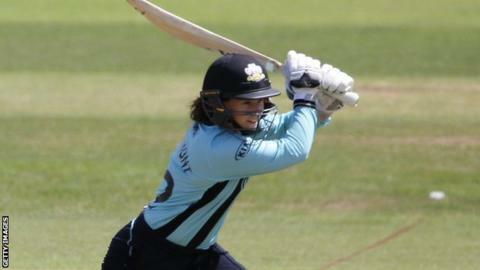 Beaumont was largely untroubled, hitting six fours in her 45-ball innings, and was eventually caught off Stephanie Butler late on - with Sciver left to lead her side home with 11 balls to spare.